Volkswagen's recently announced T-Roc R and 421hp V8 Touareg look set to be joined by yet another potent SUV as the German manufacturer's assault on the segment continues apace. That's if these latest spy shots are to be believed, at least, which seem to show a near production-ready Tiguan R testing on public roads. When approached for comment, VW was coy about the speculation, refusing to even be drawn on whether or not the car shown was a genuine test mule. 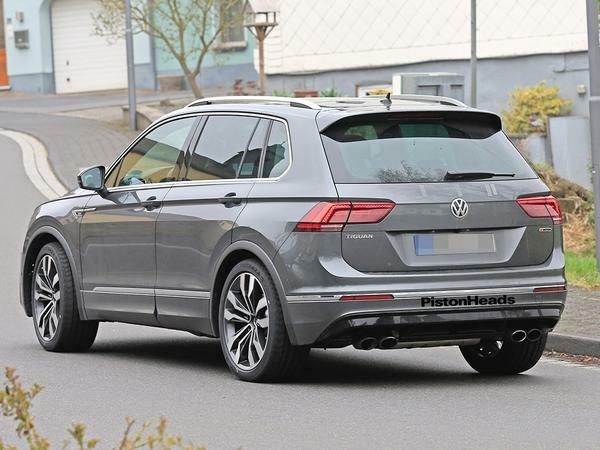 We'd wager it is, however, with the Golf R-style quad exhausts seeming to support our snapper's belief that the Tiguan in question was sporting the same 2.0-litre EA888 engine as is found in the big-selling hot hatch. The same power plant is also utilised in the upcoming T-Roc R, of course. There it produces 300hp, sent to all four wheels via a seven-speed DSG 'box for 0-62mph in less than five seconds and a 155mph top speed. 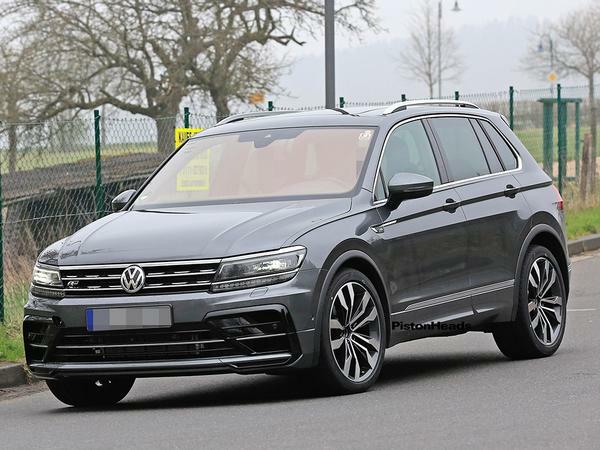 In the bigger, heavier Tiguan, however, it's likely that the motor would be wrung out further still, producing a figure equal to or even greater than the 310hp found in the Golf R.
Another option mooted is the 2.5-litre five-cylinder unit found in Audi's RS3. 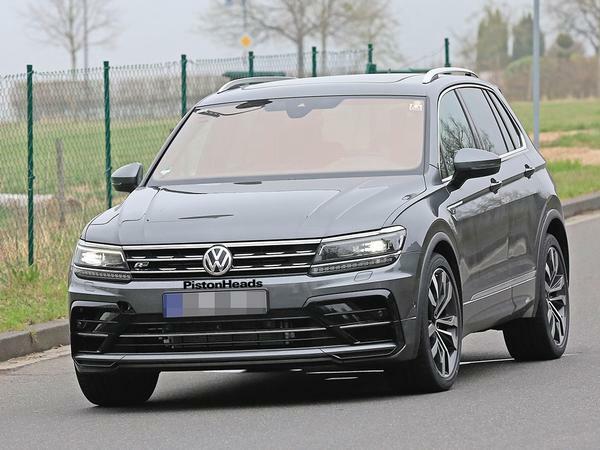 It produces 400hp in that application, enough to give the Tiguan R a seriously healthy turn of pace, and to differentiate it from the T-Roc R in a more decisive manner. That, unfortunately, seems to be a less likely scenario than the repurposing of the already-ubiquitous EA888, though. Whatever the truth, we won't have long to wait to find out. 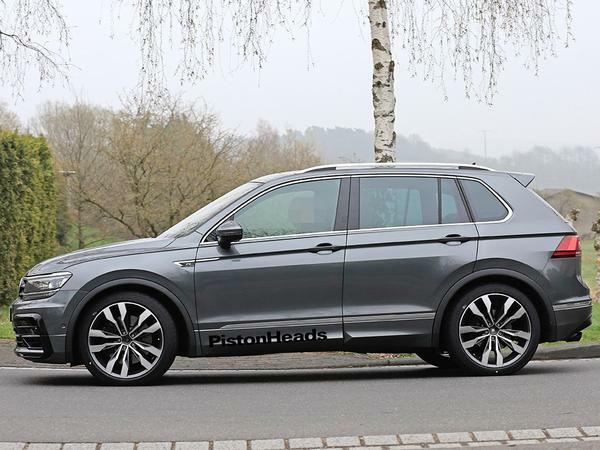 Having recently added a 230hp GTI-engined model to the Tiguan range, VW is now reportedly keen to rapidly expand its R offering, seeking to gain an advantage over rivals from within the Group and further afield as the demand for hot SUVs continues to grow. Had the MK1 Tiguan R 170TDI, and they are pretty good cars. I'm interested, if it's fast enough! The reason I've never bought a Golf R, even though it would have fitted the bill perfectly for a run around is that they just look pretty much the same as any regular Golf but with 4 x silly looking 'Halfords Special' exhaust pipes stuck on the back, two of which don't even work most of the time. If they had given the thing some wider arches, a bit like the Audi or Renault RS cars and perhaps two more subtle yet purposeful looking exhaust pipes then I'd have been all in and would probably have jumped on the bandwagon. Would have been perfect for the wife. Isn't the Golf R back to 300PS now? I thought the 310PS disappeared again? Regardless, I can't see one of these on my driveway anytime soon. The performance SUV thing is a segment I simply don't get. This thing can't go off road, so what's the point? Just buy a Golf R estate. This thing can't go off road, so what's the point? Just buy a Golf R estate. I didn't realise that it couldn't go off road. I don't think this is true - as soon as you buy one you will take the route home through the nearest desert and then skydive into your front door. The 4 exhausts will mean you can't fit a tow bar, bit frustrating for an SUV. Oh I just thought of something else, imagine the fuel economy, it should be hilarious. Add the Tiguan weight and could you get it down to single figures?? There was something wrong with your car then. I get between 28 and 34mpg out of my estate... on an urban commute. Not a fan of speed limits, eh? Wonder if these will become popular with a certain element of society, plenty of space, Golf R performance and the potential to go off road would appeal. Since when was accuracy in PH articles a thing? I keep my speeding to the track for the most part. I had it thoroughly checked by VW at the major service and they said it was perfect. Guess it just depends on the nuances of your v mine commute.